Gangsta with a sweet twist! Most people wear their heart on their sleeve, Mane share’s his love of ice cream on his face. 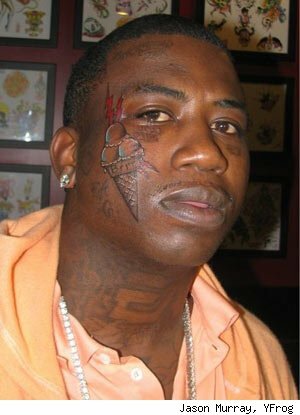 Gucci Mane The ‘Lemonade’ rapper visited Tenth Street Tattoo near Atlanta, Ga (website: http://tenthstreettattoo.com), where tattoo artist Shane Willoughby added a three-scoop ice cream cone to Mane’s right cheek. The cone has the word “Brr” across it and sits on top of a waffle cone with two red lightning bolts running through the tattoo. What food do you love enough to get it tattooed?